Paspalum scrobiculatum - Ditch Millet(Indian Paspalum) - Appetizer, Digestive, Refrigerant, Breakfast Cereals. It acts as Appetizer, Astringent, Digestive, Diuretic, Emollient, Refrigerant, Stomachic. The protein content in millet is very close to that of wheat. 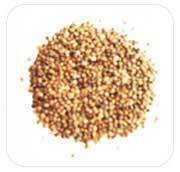 Millet is rich in B vitamins, especially niacin, B6 and folacin, calcium, iron, potassium, magnesium, and zinc. As none of the millets are closely related to wheat, they are appropriate foods for those with coeliac disease or other forms of allergy/intolerance of wheat. Celiac patients can replace certain cereal grains in their diets by consuming millets in various forms including breakfast cereals.